From Mannheim Main Station it takes about 5 minutes to walk to evalag. After leaving the station via the main entrance, follow the main road (Kaiserring) on the left side of the street. Go straight ahead, cross two pedestrian crossings and then turn left into the third side street (on the corner there is a café). The entrance of evalag is on the left, in the fourth house, right next to the shop windows of a carpet shop, diagonally opposite you see the CINEMAXX cinema. 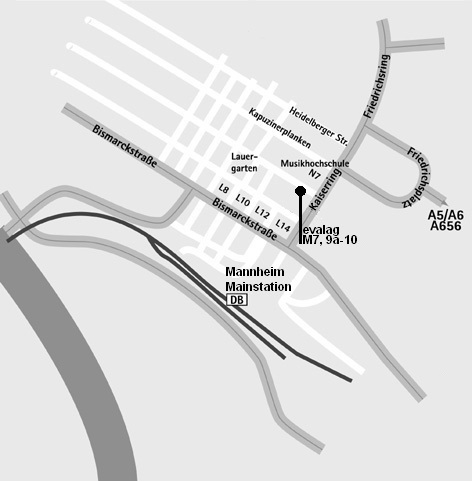 Leave the A5/A6 or the A656 and follow the directions to Mannheim City Centre and to Friedrichsring. The Friedrichsring leads onto the Kaiserring, then turn right into the Quadrat M7 (between a café on the left and a carpet shop on the right corner). After approximately 200 m you will find a public underground parking (CINEMAXX cinema) on the right where you can leave your car. The entrance of evalag is diagonally opposite to the cinema.